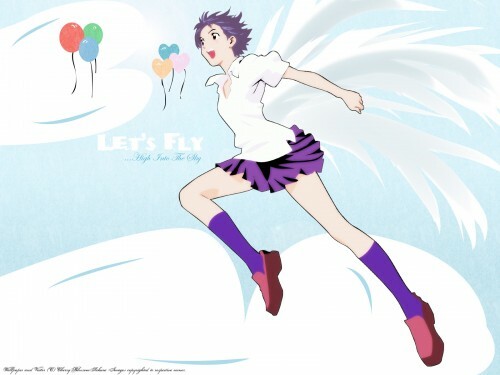 The Girl Who Leapt Through Time Wallpaper: Let's Fly! Minitokyo »	The Girl Who Leapt Through Time Wallpapers » The Girl Who Leapt Through Time Wallpaper: Let's Fly! I vectored the scan and vectored the wings from another scan then added shadows to the wings. Ya u can use it if u wish too. Whoa nice vector :) It's a bit too bright, but it's all good ^^ I do think the balloons in the background kind of killed the wall.. They seem so out of place. Other than that, good work :) Keep it up! The ballons were a nice touch!